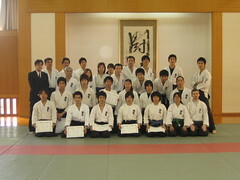 On 23 December 2008, the Toyonaka Dojo hosted the 20th Kansai Region Year-End Tournament. There were a total of about 30 participants from Osaka, Kyoto, and Kobe Gakuin University. Since this year’s National Championships were so late, we only had about two weeks to rest and prepare before this event. This included creating tenkai and team hokei. The schedule was so tight that the two tenkai from Osaka only got to practice for a total of about an hour each. Personally, I also managed to take second place in individual jissen, losing the top spot to Mr. Manji. Embarrassingly, he scored the deciding point with a manjigeri – didn’t see that one coming. I didn’t fare as well in hokei, losing to a college student. Later, Shinzato Sensei told me that my hokei was almost perfect, but he scored against me because my kamae changed levels a couple of times. OK, I get the message – I need to work on my kamae this year. Of course, the results aren’t as meaningful as those of larger, more serious tournaments. Just for one example, former all-Japan champion Sato only placed 3rd in jissen this time around, despite being clearly better at jissen than those to whom he lost. Still, it was a fun tournament and nice to get some good-natured competition going among dojomates. Nakata mentioned making this the final year of the Kansai tourney, but I really hope we can change his mind over the next ten or so months. I think it can be educational since our dojo can’t make it to Tokyo for tournaments more often. It was also a lot of fun.